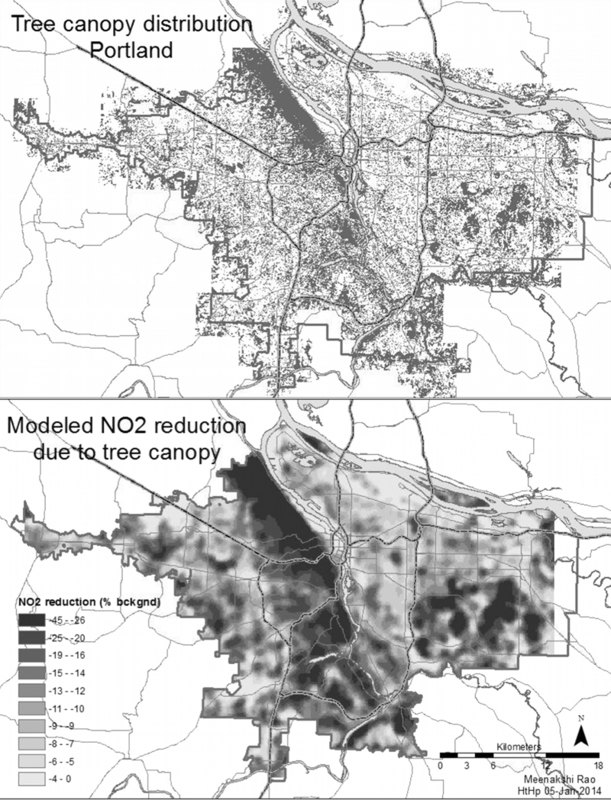 Study shows how urban trees save millions in medical bills, using a new method to model smog concentrations. Portland citizens could save $7 million annually by planting more trees, according to researchers at Portland State University. The team of biologists, environmental scientists, and urban planners developed a new methodology that could help municipalities maximize the health effects of urban greenery. The researchers first developed a novel way to model highly localized pollution levels, noting that people living within 200 m (0.12 miles) of major roadways are at much higher risk for asthma and other respiratory problems. (Current methods of modeling air-pollution levels capture a much larger radius, typically greater than 10 km, or 6.2 miles.) By accurately predicting where pollutants concentrate, they argue, urban planners will be able to strategize about where mitigation is needed. In the course of this work, the scientists discovered dramatic reductions in expected pollution levels in areas with high concentrations of trees. The team drew on epidemiological research to arrive at the $7 million projected savings for Portland but added that their work should be applicable everywhere. As you might imagine, in our modern, de-industrialized cities, air pollution is not as much from industry as it once was, but is much more from cars. This is especially true near highways and heavily used arteries. Air pollution from cars, seemingly combustion products and grit, comes in many forms. The sort described in this article is probably 2.5 micron or larger in size and mostly affect respiratory health. Another key type of pollutant is defined as Ultra Fine Particulate. These are also combustion products, but they have less effect on respiratory health but much greater effect on cardiovascular health. The other key quality of ultra fine particulates is that the concentrations are much higher the closer you get to a highway. Because of this quality, changing air management in buildings near to highways, and generally avoiding building near highways, are important for avoiding serious adverse health effects. You always figured it was true.... now the evidence is pretty strong.